To find ratings, traveler tips, photos, and more tourist information, use the Grand Canyon National Park road trip planning app . 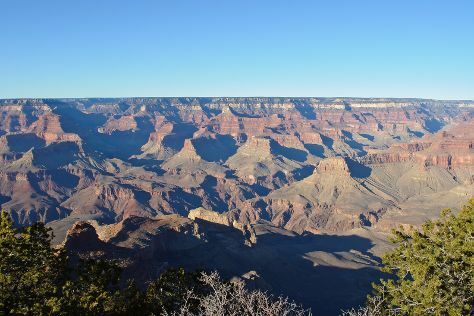 Philadelphia to Grand Canyon National Park is an approximately 12-hour combination of flight and bus. You can also drive. The time zone changes from Eastern Standard Time to Mountain Standard Time, which is usually a -2 hour difference. When traveling from Philadelphia in May, plan for slightly colder days and colder nights in Grand Canyon National Park: temperatures range from 68°F by day to 33°F at night. Finish your sightseeing early on the 14th (Tue) so you can travel to Las Vegas. On the 15th (Wed), have fun at Battlefield Vegas and then take in the dramatic natural features at Red Rock Canyon National Conservation Area. For maps, reviews, photos, and more tourist information, you can read our Las Vegas trip itinerary builder . You can do a combination of flight and car from Grand Canyon National Park to Las Vegas in 4.5 hours. Other options are to drive; or take a shuttle. The time zone changes from Mountain Standard Time (MST) to Pacific Standard Time (PST), which is usually a -1 hour difference. When traveling from Grand Canyon National Park in May, plan for a bit warmer days and much hotter nights in Las Vegas: temperatures range from 87°F by day to 64°F at night. Finish your sightseeing early on the 15th (Wed) so you can travel to Los Angeles. Start off your visit on the 16th (Thu): admire the natural beauty at The Huntington Library, Art Collections and Botanical Gardens. For photos, traveler tips, ratings, and other tourist information, you can read our Los Angeles online vacation builder . Traveling by flight from Las Vegas to Los Angeles takes 4 hours. Alternatively, you can drive; or take a bus. Plan for slightly colder temperatures traveling from Las Vegas in May, with highs in Los Angeles at 75°F and lows at 59°F. On the 16th (Thu), wrap the sightseeing up by early afternoon so you can travel to Yosemite National Park. 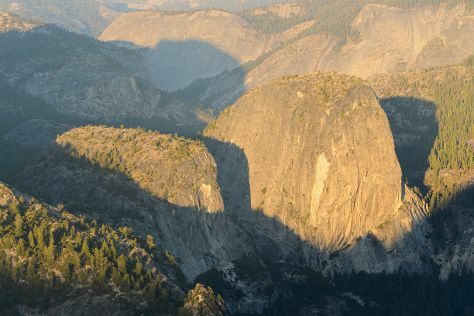 On the 17th (Fri), admire the sheer force of Yosemite Falls, then get great views at Tunnel View, then take in the views from Pohono Bridge, and finally explore the striking landscape at Glacier Point. To find other places to visit, traveler tips, reviews, and other tourist information, read Yosemite National Park itinerary planner . Traveling by combination of flight and car from Los Angeles to Yosemite National Park takes 4.5 hours. Alternatively, you can drive; or do a combination of flight and bus. When traveling from Los Angeles in May, plan for a bit cooler days and cooler nights in Yosemite National Park: temperatures range from 65°F by day to 34°F at night. Finish your sightseeing early on the 17th (Fri) to allow enough time to travel to Stanford. Stanford is a census-designated place (CDP) in Santa Clara County, California, United States and is the home of Stanford University. Start off your visit on the 18th (Sat): admire the masterpieces at Rodin Sculpture Garden and then stroll through Wunderlich County Park. To find traveler tips, maps, and more tourist information, refer to the Stanford online vacation planner . Use the Route module to find suitable travel options from Yosemite National Park to Stanford. Traveling from Yosemite National Park in May, expect nights in Stanford to be warmer, around 55°F, while days are somewhat warmer, around 72°F. Finish your sightseeing early on the 18th (Sat) so you can travel to San Francisco. Kick off your visit on the 18th (Sat): take in the views from Golden Gate Bridge. 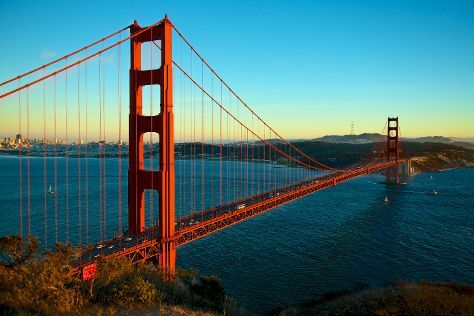 For other places to visit, more things to do, traveler tips, and more tourist information, you can read our San Francisco online vacation planner . You can drive from Stanford to San Francisco in an hour. May in San Francisco sees daily highs of 69°F and lows of 53°F at night. Finish your sightseeing early on the 19th (Sun) to allow enough time to travel back home.